This is a fun ornament project from Martha Stewart that you can also eat! For little kids, use the project to talk about colors (red and white) and shapes (circles). With older children you can discuss taste and where peppermint flavor comes from. 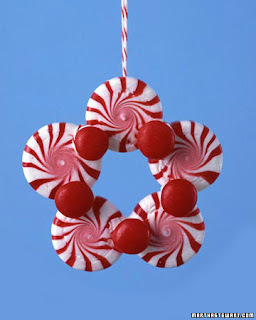 Lay five or so peppermint candies in a circle to form a wreath; bond sides together with icing. Adorn front with cinnamon candies or mints. Let dry two hours before hanging. Loop twine around ornament; knot.